There is something exceptionally comforting about a bowl of pasta tossed with your favorite ingredients. 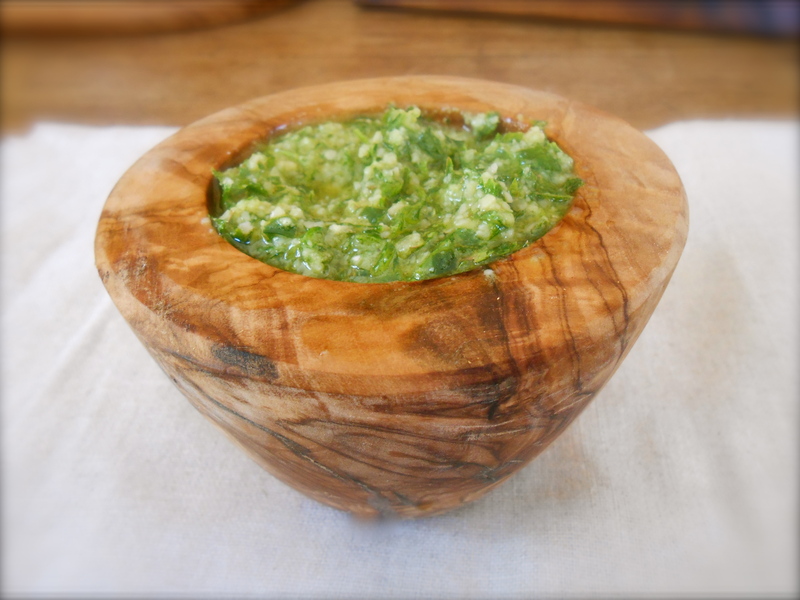 Even in the summertime a lovely herbaceous parsley pesto with a sprinkling of dry chili flakes is a perfect way to wind down and and enjoy the end of a hot summer day. BLT sandwiches happen to be a favorite around here, so why not toss the ingredients together with a nice pasta such as mezze penne? Rather than lettuce we used spinach. Bacon “leafy green” tomato pasta. The steps are quite simple. You put eight slices of center cut bacon in a large skillet over medium heat and a pot of water on the stove to boil. After the bacon is cooked to a crisp remove from the skillet and set aside. Prepare the pesto and set aside. Leave the kitchen for five minutes with both a pile of cooked bacon sitting on the counter and your hungry sixteen year old son sitting at the kitchen table with his computer. Return to the kitchen and find there are only 4 slices left! What? Yes, that is exactly what happened. Our BLT pasta only had a total of four slices of bacon. Although wonderfully delicious, next time I make this (and I will) I’ll keep a better eye on that bacon! Put a large pot of water on the stove over high heat and bring to a boil. Heat a large skillet over medium high heat. Add bacon; cook 6 minutes or until crisp. Remove bacon from pan, slice and set aside. Keep the skillet on the stove (no heat) with the bacon fat in it. To make the pesto, put the parsley, parmesan, garlic, and salt in a food processor and pulse for a few seconds to combine. Scrape down the sides of the bowl, then pulse again. Drizzle in the olive oil while the machine is running just long enough to incorporate the oil. Set aside while waiting for the pasta to cook. Reheat skillet and add tomatoes to the bacon drippings; cook 3 minutes or until tomatoes are tender, stirring occasionally. Drain the penne and return to the pot. Toss with the pesto sauce until well coated. Add the tomatoes and spinach to pasta and gently toss. Serve with crumbled bacon and a sprinkling of parmesan. Hello there! How have you been Prudy? BLT pasta is a winner! I couldn’t believe my eyes when I stepped back into the kitchen. He ate 4 pieces in 5 minutes! Aw well, I couldn’t be mad at him. It’s hard enough for me not to eat it while I’m cooking! :) Hope it’s all good for you. It’s very nice hearing from you today. great pasta, I would be happy as a guest, and would not steal any bacon. Promise. Yes! Bacon has a way to make everything perfect. :) This is a keeper recipe for sure. Wow what a beautiful, fresh and simple recipe. Those tomatoes are stunning. I like your method! That’s how I do most meals I like the most….set it in motion, leave, come back and it’s ready! Your pestos are inspirational. I don’t make nearly enough. I love the addition of parmesan cheese. Ha! I love home grown tomatoes. So jealous. That’s amazing!!! I was a fish monger and you can definitely freeze fish. 100lbs! Wow. 3am sounds about right. What people used to do when they had extra from fishing trips like that was sell it to us. I’d say keep as much as you want. It lasts in the freezer (check online for how long, but I think it’s quite awhile) and sell some of it to the local fish store if you have one. They’d be happy to have it. I have no idea about pricing though. Ah! A good problem to have. If I were there is take some of your hands. It’s so fresh you could make a tartare or sushi it a lightly seared sesame tuna with soy dipping sauce (the only tuna recipe on my blog) or cook it and make homemade tuna salad for sandwiches or salad greens. It’s such a different flavor from bumble bee. Your pasta looks so refreshing and summerish Seana! I can totally see that in my sandwich. Will surely try it. I have heard good reviews of it with pecans. I really love the fresh simplicity of this. Thank you so much! :) Very simple indeed. I love pasta using fresh vegetables, not cooked. So good! This is so simple and I love it, it lets the best of summer produce shine. Delicious recipe Seana. Thank you Suzanne. I love Stacey’s idea of using grilled romaine lettuce rather than spinach! Brilliant. A true BLT pasta! Delicious. My husband has been asking for pasta and this sounds perfect for summer! I think I will try it with grilled romaine lettuce rather than spinach, just because you paint such a lovely picture of a traditional BLT. Brilliant! I love the idea of grilled romaine instead of spinach! I’m going to make it again and do the same. Thank you for the idea! Cool, let me know how it turns out and I’ll do the same. Lovely. It’s foolhardy to leave a teenager anywhere near food. This looks lovely, I am a huge fan of those baby tomatoes, they’re so sweet! How often that scene is played out in our kitchen. At least he didn’t eat all eight. That’s positively considerate for a 16 year old boy. I have a feeling this is not new to a lot of folks! :) And that’s positive thinking that he didn’t eat all eight pieces of bacon. Oh well, the pasta was still wonderful even with 1/2 the bacon. 100lbs of tuna?! You’re kidding me. Actually, tuna goes great with bacon – if you have any left! Hahaha. That was so funny about your son. Funny thing is, I can’t stand the smell of cooked bacon. Always reminds me of a farmyard. But I ate pasta last weekend for the first time in maybe 6 months. And looking forward to risottos during autumn. Now for some serious pestos. Yes, my local supermarket is now selling fresh herbs! At last. Admittedly, most are only suited for compost. But the parsley is nicely fresh. Oh, and I happened on TK (TJ?) Maxx’s Home dept earlier today. Heavily discounted N York skillets. And other beautiful pans. I’m done for! I was so excited about this dish beause my family loves bacon and pasta, it was a hit with my teenage granddaughter the 13 yr old and my daughter loved it. I will be making this dish often. Thank you again. Fall is definitely in the air and I couldn’t be happier. :) Love the cooler temperatures and the spectacular colors…oh, and of course autumn food is my favorite too! Crispy bacon only lasts a few seconds around here too Seana! I love this little pasta dish – such beautiful fresh and simple ingredients to make a wonderful summer meal! Your 2 wooden bowls are also stunning – love their unusual shapes… so much character! I love those bowls too! Interesting you noticed the unusual “egg” shape. Nothing like a good wooden bowl. :) Thank you Margot, oh and the BLT pasta is really delicious! Love the sound of your BLT pasta sauce Seana and I can’t wait to see how you weave your magic with all that beautiful fresh tuna. Day 1 sashimi? Hi Sandra. I like your new gravatar! :) My oh my we have enough albacore to open a fish market. We have been searing, grilling and sharing! It is so fun to see how excited our friends & neighbors are when we deliver fresh wild caught tuna! The fishing excursion was quite an experience for my “non-fisherman” husband. And it’s great to have a freezer full of albacore. Pasta is my weakness… but bacon and pasta… how could you say no to that! You can not say no to bacon and pasta. period. :) BLT pasta is every bit as delicious as a BLT sandwich. You must make some Matt. Hi Seana, what a lovely sounding dish, sounds like your son thought so too. Have a nice holiday week-end! Love the boy and his bacon story! And the pasta. But the 100 pounds of tuna has me really going. WOW. Sushi! Sashimi! Seared tuna in black sesame seeds with wasabi on the side. Yum yum yum. How fabulous. I effing love a BLT and this pasta would go very well my face too! Just need to make sure the kids stay away from the bacon to ensure some makes it to the table, eh. Mine would’ve done the same!! Nice work my friend. wow! i absolutely love your pasta! it looks delicious! 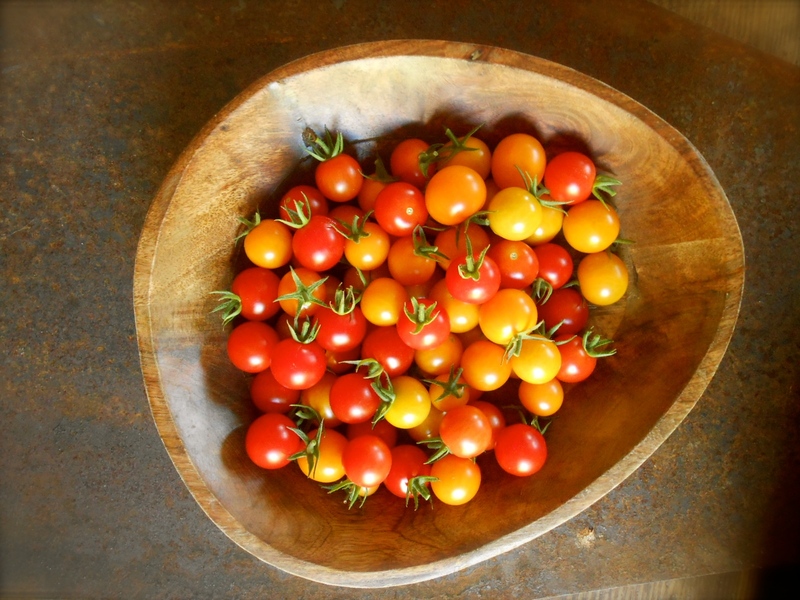 What a comfortable meal that everyone would really dig into.– and I loved the wooden bowl cradling your tomatoes!! I have the same problem with the bacon at my house! And like Cooking with auntjuju, I had to tape notes, hide food, write on things with sharpies, etc. i considered padlocking the fridge! I really did! This looks lovely, and I have never thought to add red pepper flakes to a pesto dish, but now I can’t wait to try a few next time! What a pretty pasta dish with such a colorful combination of ingredients. Seana– Glad to hear everythings’s going well– Be happy to see your cooking pics/recipes whenever they appear- Love all your great recipes– and fresh ingredients!! Love this – it’s not complicated but I’m sure it’s loaded with flavor! 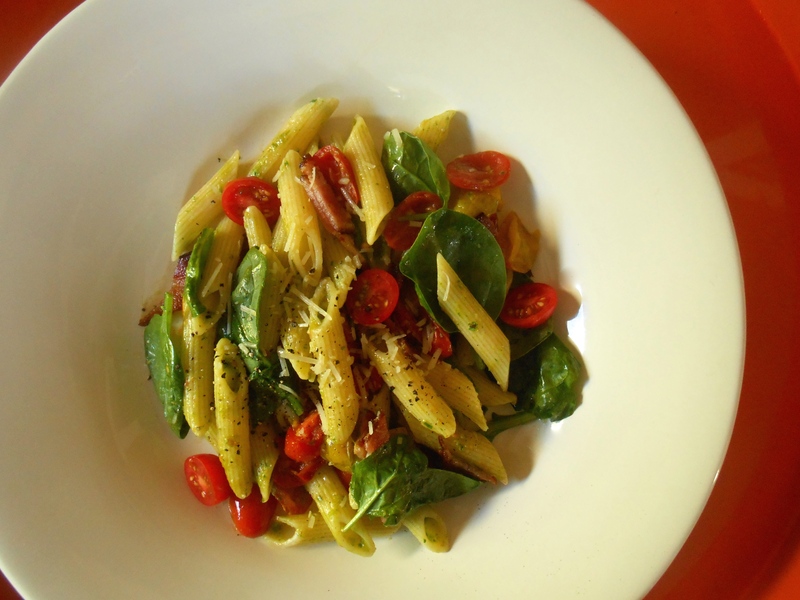 You are currently reading bacon “leafy green” tomato pasta at COTTAGE GROVE HOUSE.